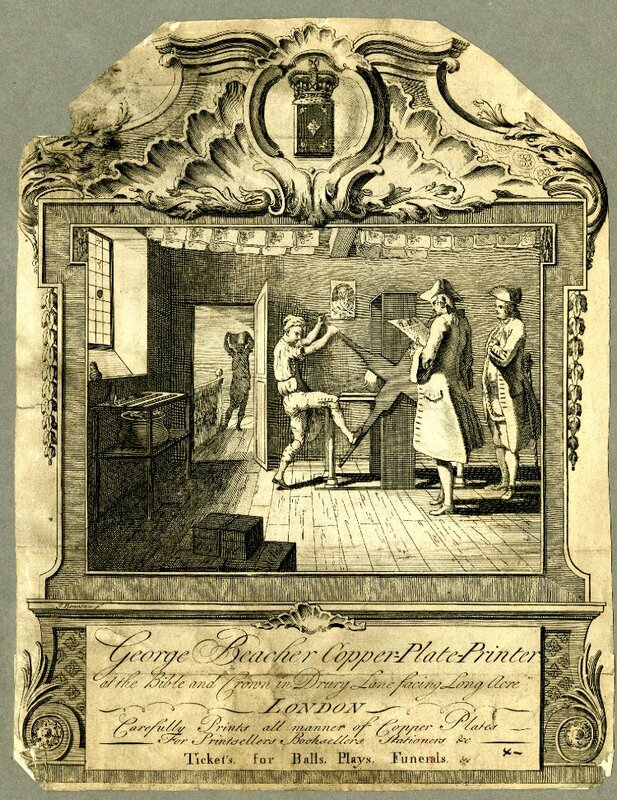 Illustrated trade card of the printer George Beacher, showing his workshop on Drury Lane sometime in the 1740s. Beacher is shown on the far right supervising production, while a client peruses a copy of a freshly printed image. A shopman is operating the press to their left while, through the door, we see an assistant carrying in bales of fresh paper. William Hone included a fascinating little piece on the history and customs of London’s print-trade in the 1825 edition of his Every-Day Book. The article was based on information Hone had gathered from a number of earlier texts on the publishing trade, many of which dated back to the sixteenth and seventeenth-centuries, and supplemented with his own substantial knowledge of the contemporary world of the metropolitan print and bookseller. It offers us something of an insight into the everyday experiences of the men and women who populated the backrooms and garrets in which some many of the eighteenth-centuries caricature prints were manufactured. 1. Swearing in the chapel, a solace. 2. Fighting in the chapel, a solace. 3. Abusive language, or giving the lie in the chapel, a solace. 4. To be drunk in the chapel, a solace. 5. For any of the workmen to leave his candle burning at night, a solace. 6. If a compositor fall his composing stick and another take it up, a solace. 7. For three letters and a space to lie under the compositor’s case, a solace. 8. If a pressman let fall his ball or balls, and another take them up, a solace. 9. If a pressman leave his blankets in the timpan at noon or night, a solace. 10. For any workman to mention joining their penny or more a piece to send for drink, a solace. 11. To mention spending chapel money till Saturday night, or any other before agreed time, a solace. 12. To play at quadrats, or excite others in the chapel to play for money or drink, a solace. 13. A stranger to come to the king’s printing-house, and ask for a ballad, a solace. 14. For a stranger to come to a compositor and inquire if he had news of such a galley at sea, a solace. 15. For any to bring a wisp of hay directed to a pressman, is a solace. 16. To call mettle lead in a founding-house, is a forfeiture. 17. A workman to let fall his mould, a forfeiture. 18. A workman to leave his ladle in the mettle at noon, or at night, a forfeiture. Workers were also expected to make contributions to the workshop’s kitty for a variety of other reasons including, marriage; the birth of a child (with the contribution to celebrate the arrival of a son being almost double that required for a daughter); the completion of an apprenticeship; a promotion; or the offer of a new job with a different printing house. That one of the rules mentions that printers should also contribute towards the cost of providing drinks for any wives who happened to be present in the office when the money was being shared out, rather suggests that the vast majority of “chapel funds” were spent on drink. “Bad copy” – An insult used to describe works which the shopmen felt were poorly written or presented. “The case is stood still” – The compositor who is responsible for setting the type, is not at his station. “Cassie paper” – Torn, wrinkled, stained or otherwise faulty sheets of paper. “Companions” – Two press-men working at the same press. “The Devil” – The errand boy responsible for pulling finished sheets from the press and carrying them to the typeman. The name derives from the copious amounts of ink that the boys would often find themselves covered in after a hard day’s work. For this reason Hone notes that they were also often jokingly referred to as “spirits” and “flies”. “Froze out” – A temporary closure of the printworks owing to severe weather. Printing became impossible in harsh winters as reams of paper, blocks of type and pots of ink often froze solid. “Great numbers” – Producing more than 2000 copies of a single print or book. “A hole” – Premises of a printer specialising in the production of bootleg editions of other men’s works, or other forms of illicit publication. “Pigeon holes” – Whites between words as large, or greater than between line and line. The term is used to scandalize such composition; it is never suffered to remain in good work. “Turn for it” – A retort or rebuke used to address workmen complaining about a lack of money, or anything else, it refers to turning the printing press and essentially means “work for it”. That Hone felt such terms to be worthy of recording suggests that the ancient language and customs of the city’s printers had already fallen into abeyance by the mid-1820s and in many ways the information above probably reflects the world of the London printer as Hogarth would have known it two generations earlier. Nonetheless it is certainly an interesting aside and reminder of what a treasure trove of historical trivia Hone’s works have preserved. This painting is undoubtedly one of the most impressive watercolours by Thomas Rowlandson to find its way onto the market in recent years. It is titled Entrance to Blackwall Docks and was one of a number of different images of the huge shipyard at Blackwall to have been painted by the artist during the early 1800s. 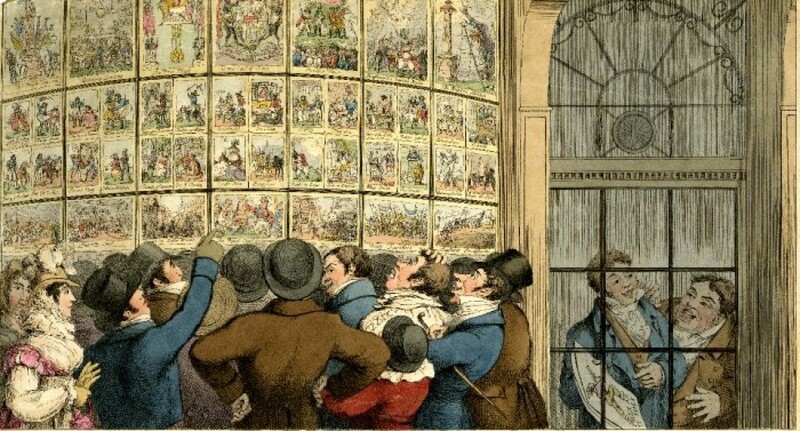 Rowlandson made a number of copies of this picture and variant editions are listed in both the British Museum and Museum of London catalogues. Another copy (possibly the one shown here), was also sold at Sotheby’s in 1962 and was recorded as previously belonging to the widow of the French engraver and illustrator Jean Émile Laboureur. The various editions of the painting were not identical, and if one compares the image shown above with that in the British Museum’s online catalogue it is possible to identify a number of minor amendments and additions to the scene. 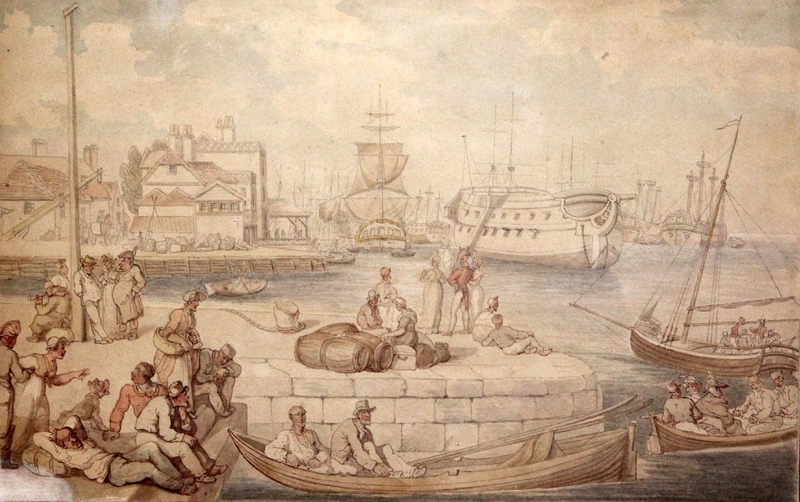 In the image above, Rowlandson has replaced the ladies in the longboat to the right with two portly naval officers, while a pair of gentlemen enjoying a quite smoke has been added to the party of idlers gathered around the flagpole on the left. The configuration of the two sailors in the rowing boat that occupies the central foreground has also been changed, so that both are now shown lolling about in the afternoon sun. The presence of the two-decked warship which appears in the centre of all of the known versions of this image is another significant feature, as it allows us to date the painting with some degree of certainty to the period between 1805 and 1807. It was in those years that Blackwall Yard received a commission to build three two-deck 74-gun ships of the line which were subsequently launched under the names Magnificent, Valiant and Elizabeth. These are the only Royal Navy vessels known to have been built at Blackwall during the Napoleonic Wars and they were evidently still being fitted out when Rowlandson arrived on the dockside with his sketchbook. It’s hardly surprising that Rowlandson was able to find more than one customer for his paintings of Blackwall. The shipyard specialised in the construction of merchant vessels and had boomed on the back of Britain’s expanding empire and commercial preeminence. By the end of the eighteenth-century Blackwall Yard had become the largest privately owned shipbuilding complex in the world and served as a source of pride and fascination for those who saw it as a symbol of their nation’s maritime supremacy. This is clearly reflected in Rowlandson’s image, not only by the mere fact that the artist considered the Yard to be a suitable setting for a commercial painting, but also by the presence of the many fashionable strollers who can be seen inspecting the buildings and ships from the quayside.